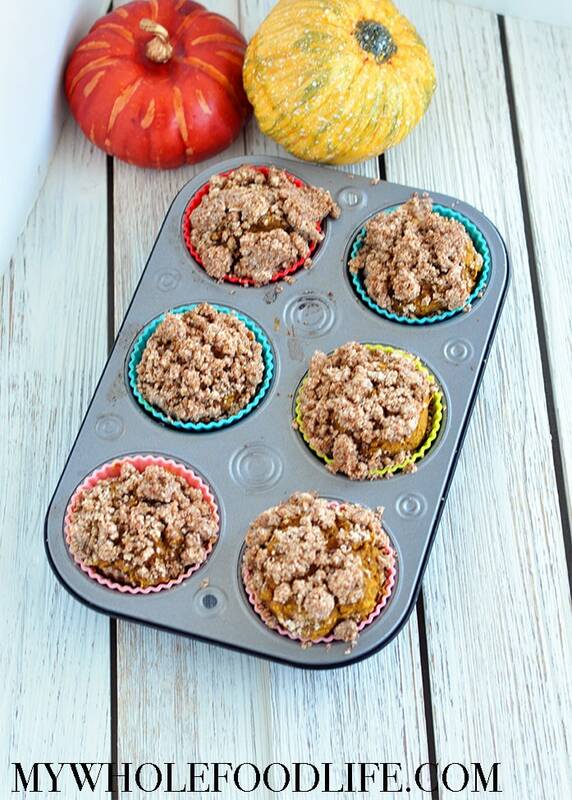 Pumpkin Spice Coffee Cake Muffins. One of my most favorite muffin recipes on the blog is the healthy chocolate chip pumpkin muffins. We make them all year long! So I kind of tweaked that recipe a bit to create these new pumpkin muffins. 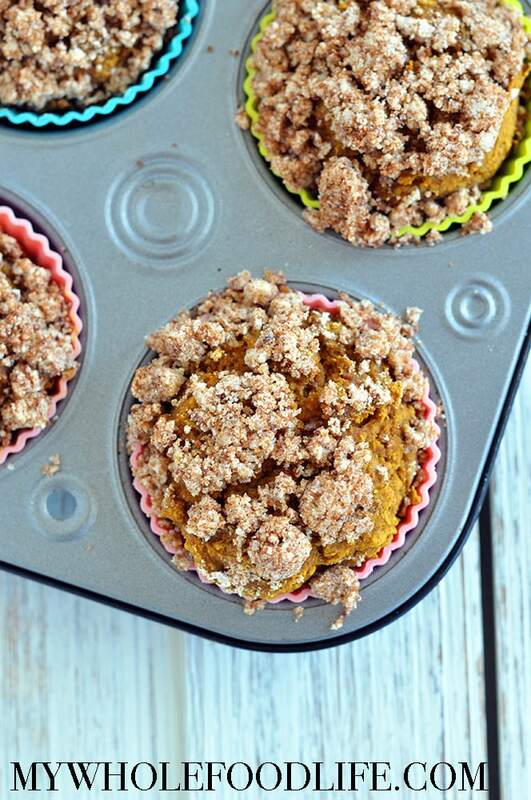 These healthy muffins are seriously delicious. Also vegan and gluten free. You can easily make them nut-free by using a different kind of milk and a different flour for the crumb topping. These muffins remind me of the kind you find in bakeries. The crumb topping really adds something special. They are super easy to make too! In under 30 minutes, you can make these healthy muffins that taste as good as any bakery muffin. Vegan and gluten free. In a large mixing bowl , add all the dry ingredients. In another mixing bowl , add the wet ingredients. Spoon batter into lined muffin pans . Mix the crumble ingredients in a small mixing bowl . Sprinkle the crumb topping on each muffin. Bake the muffins for about 15-20 minutes. Let cool before removing from pans and storing. These muffins should last about 2 weeks in the fridge. You can also freeze them for longer. Enjoy! There isn’t any coffee in this recipe- is that correct? I used cooked pumpkin in a can. Can I use any other GF flour in place of oat flour? Yes. Bob's Red Mill All purpose gluten free flour should work great. It's a 1:1 sub for it. How about coconut or almond flour? Coconut flour is a very tricky sub. It will not work. Almond flour may work, but I haven't tried to say for sure. I'm sorry to say that these were very bland - kind of a weird texture and not tasty. I couldn't convince anyone in my household to eat them and ended up throwing them out. I don't intend this feedback to be unkind but think the recipe needs a bit of tweaking. Hi Sheila, I am so sorry you didn't care for them. :( I appreciate the feedback. I think the main problem (and I didn't realize this until after I made them) is that there isn't any salt in the recipe. Even if you don't want a dish to taste savory, per se, you still need to add a little salt to intensify the other flavors. As is, I won't make these muffins again. I think I might use the basic recipe, but I'll change the spices to a pumpkin spice blend and add a bit of salt. Could I sub the flax eggs with regular eggs? Would it make a difference? I made these this morning and they were delicious! The only change I made was to add 1 tsp pumpkin pie spice, because I love baking with it. I could see how people might think they need salt, but I don’t think it’s necessary. The crumb topping was amazing!!! I made these today and they are amazing! So yummy and flavorful! I didn't make any changes to the recipe. Even my husband enjoyed them, and he doesn't have to follow a special diet like I do. I'm afraid he's going to eat them all up!